To calculate the Pressure Drop across the PRV Station, we have to determine the inlet and outlet pressures. The inlet pressure is determined by the PRV location in the building. The lower the PRV is in the building, the higher the static inlet pressure will be. Typically, the PRVs are fed by a Pressure Boosting System that feeds the entire building, so the inlet pressure may also fluctuate a little, depending on the demand in the rest of the building. The outlet pressure is determined by two factors. First is the number of floors the PRV Station is serving, and the second factor is whether the station is feeding the floors above or below the station. A good rule of thumb is that each floor will result in a pressure change of 5 PSI. If the floors fed by the PRV Station are the floors above, then you would need a higher outlet pressure at the PRV Station (around 65 to 75 PSI) because the pressure will drop about 5 PSI each floor higher in the piping. If the PRV Station is feeding te floors below, the outlet pressure would need to be lower (around 40 to 50 PSI) because the pressure will increase 5 PSI for each floor lower in the piping. We recommend keeping the pressure drop across any single PRV to below 100 PSI to avoid poor performance, cavitation, noise and valve damage. The water-flow demands of a PRV Station depend on the number of fixtures being served by the station andbcan be calculated using Hunter’s Curve, which unfortunately doesn’t account for diversity in the system demand. If the building’s water flow is overestimated, PRVs tend to be oversized and do not perform well at partial load conditions. Combining two valves in parallel with High and Low Flow Valves helps to keep both valves operating within their design conditions across all load demands. flow. A pressure switch senses the high pressure downstream of the PRV and signals the control panel to close the block valve. The control panel also sends the alarm signal to the building manaement system to alert the building engineers. As with Level Control Systems, we always recommend monitoring these alarm outputs. 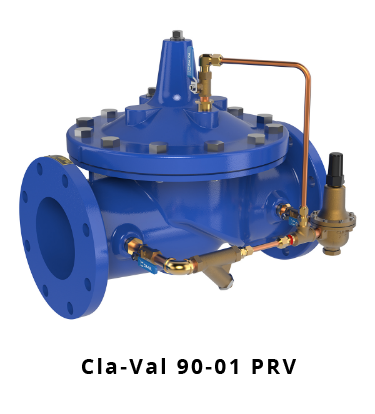 Cla-Val has a Factory Sizing Program that provides Pressure Reducing Valve selections that handle the pressure drop across the entire flow range of the station without excessive velocity or noise. 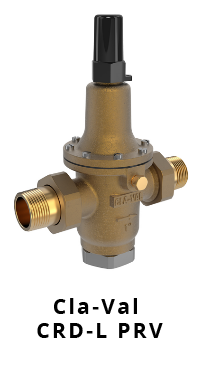 At Cougar, we take the valve selections from Cla-Val and combine them with our control system to provide a complete solution for Water PRV Stations. For more information, or to request PRV sizing, please contact us here.